Show customers they belong to your preferred group, and they will take on and defend its traits. 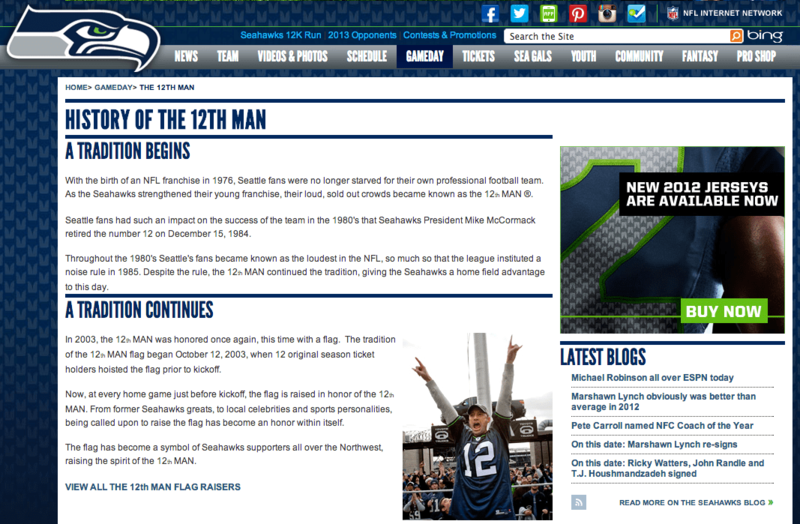 The Seattle Seahawks’ “12th Man” designation for fans shows how much they embrace supporters as part of the in-group. Note the prominent link to the store, where people can show their in-group affiliation by purchasing jerseys and other Seahawk logo items. If you follow sports of any description, you’ll be familiar with the great feelings you experience when “your” team wins. Why is this the case? You weren’t out there competing. You didn’t train for months beforehand. You may not even have been in the same city as the sporting event. In fact, you were probably sitting at home in front of the TV with a beer in one hand and the remote control in the other. The truth is that you get feelings of self-esteem by associating with the successful team. You like basking in the reflected glory. The team’s success contributes to your sense of identity. Provide a clear differentiating factor between in-group and out-group members. This distinction is the most important step in creating and maintaining an in-group. Clearly identify the out-group because that’s what provides the focus for the in-group to co-operate and self-identify. Increase the in-group/out-group contrast by exaggerating the perceived difference between the groups’ characteristics. Make it easy for individuals to identify with your group’s philosophies. They will then see your group in a more positive light, and be biased against those who are defined as being in an out-group. Attribute positive behaviors to in-group members and negative behaviors to out-group members. Then, emphasize the positive behaviors that lead to your desired behavior in the in-group. It helps if the in-group is able to see themselves as the winners rather than being the underdog, and as the heroes rather than the villains. Emphasize the thing that makes them positive, even if it’s just a different wording of the same trait (“loyalty to our family” versus “nepotism”) or two sides of the same coin (“we treat our members well” versus “they are hostile toward outsiders”).